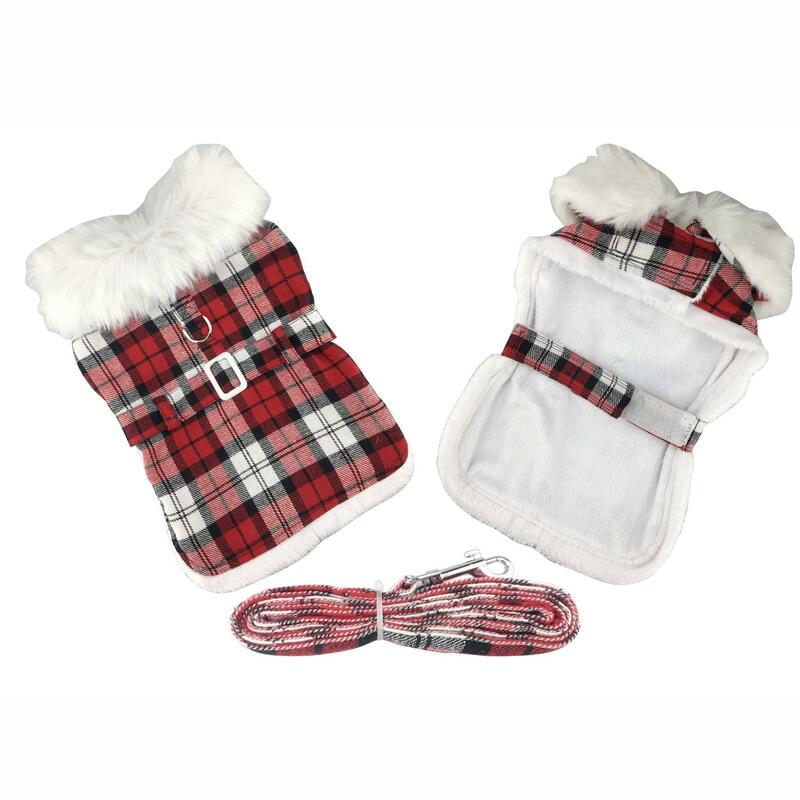 Dress in high fashion and warmth this season with the Plaid Fur-Trimmed Dog Harness Coat - Red and White by Doggie Design! Bring on the fashion runway with this stylish Plaid Fur-Trimmed Dog Harness Coat - Red and White by Doggie Design! This cheery plaid is perfect for the holidays or any time that winter weather dares to blow our way. The matching leash shows your pup is perfectly poised and polished from head to paw! The belted coat secures around the waist with a wide swath of touch fastener to provide a nice amount of adjustability. Likewise, the collar also secures with touch fastener for a perfect fit. Doggie Design understands that dogs of all sizes like to feel warm and look like designer dogs, and they've expanded available sizes to include breeds with chests up to a 30-inch girth. The coat features three layers of protection: The woven cotton/poly blend red plaid shell, a luxurious white minky plush fur lining and collar detail, and a fiber-filled inner layer for extra warmth. Putting the coat on your dog is a breeze! And you're ready to hit the town! Be sure to capture your outings with your pet in their coat and send in your photos! Coat care: Hand wash, line dry. Plaid Fur-Trimmed Dog Harness Coat by Doggie Design - Red and White Customer Photos - Send us your photo! Miss Ruby loves to play in the snow wearing her beautiful red plaid coat with matching leash! Thanks to Baxterboo she is the best dressed girl in our neighborhood! The medium fits my little man perfectly! I'm happy with the fit and loved the style so much I bought different colors for my other 2! I honestly looked at a photo of someone else's review and decided the M would fit him and it did. Archie is about 10lbs and he's ready for the snow! Bring it on! My babies stay warm and cozy in their Baxter Boo coats. This is Landi's favorite coat for chilly walks. The fur lining is super soft & the harness has a lot of leg room. Roxy looks so cute !!! Roxy is soooo cute in her coat she is now 10.5 lbs she has the medium. Jammy loves his new red plaid harness coat! Jammy is precious in his red plaid harness coat! Cute, but much too small! Cute, but very light-weight. Size runs extremely small. I ordered a medium for our little dog who is approximately 11 lbs., and it looked more like a short shirt than a coat. Mediums (and even smalls) are what the other coats are that we have for him. We gave this away rather than paying to return it. I love the Velcro closures, which is why I originally selected this coat. Very disappointed it did not fit. I did order the correct size based on my pets' measurements but appears this product runs small and is too light weight for Nebraska winters. Otherwise, it couldn't be cuter. If you're looking for something heavy and warm, I wouldn't recommend. With this coat, she now looks like a girl! Posted On 12/11/18 by Angela K from Tustin, CA Yes, Angela K recommends this product! My 7 month old Shiba is black and tan, so a more rare color for a Shiba, and everyone thinks she's a boy, or a puppy shepard, or husky... But after wearing this everyone can finally tell Zelda is a female Shiba, haha I love the jacket. It has a velcro front by the neck, and a velcro band that goes around the stomach. It fit pretty well. She's 19lbs and has a 19" chest. The matching leash is also cute. I just like how festive it is, and not over the top for a coat. I usually never dress my dogs, unless in functional weather clothing. But this was cute! Posted On 09/07/17 by lauren from allentown, PA Yes, lauren recommends this product! i have had this cute, beautiful warm coat for about a year still looks new. Loove it !! Posted On 07/01/17 by Barbara H from Mobile, AL Yes, Barbara H recommends this product! Posted On 06/22/17 by Vicki from , Yes, Vicki recommends this product! This coat is adorable and fit perfect! can't wait for her to get to wear it this winter! Posted On 06/19/17 by Jennifer C from Queenstown, MD Yes, Jennifer C recommends this product! Can't wait to put this on my dog when the weather gets cold this winter. She wouldn't be in a hurry to come back into the house since this will keep her warm outside. I have the medium for my 10.5 lbs dog, love your sales !!! A must have for colder weather. Posted On 05/04/17 by ELLEN C from SWARTZ CREEK, MI Yes, ELLEN C recommends this product! Looks & made great. So cute, easy on & off. Loooove this little coat !!! my dog Roxy looks so super cute in her Fur -trimmed dog coat. She is 10.5 lbs i have the medium. she has lost a little amount of weight. so the adjustable straps are perfect. happy this was only $9 and i got Free shipping. my dog is 11 lbs and i have the medium fits her good. Posted On 10/10/16 by Sandra S from Avon, IN Yes, Sandra S recommends this product! This well made plaid WITH matching leash is so cute. It just velcros under her belly,making it easy on and easy off. The plaid is bright making it very eye catching. Our fur baby will be wearing this coat for our Christmas card picture. Posted On 09/02/16 by Margo Crosthwaite from Walnut Creek, CA Yes, Margo Crosthwaite recommends this product! I just love this little coat. I purchased it in brown and beige earlier and it is so adorable and well made. Posted On 05/08/16 by Jenell Armstrong from Syracuse, NY Yes, Jenell Armstrong recommends this product! Super cute, well made, good fit, nice quality and gorgeous!! Posted On 04/09/16 by Linda C from Riverside, RI Yes, Linda C recommends this product! So Pretty and warm!!! Lots of compliments!! Very easy on and off. Leash hook on outside of coat is very helpful!! Going back for another color!! Posted On 03/21/16 by Amaya M from Boston, MA Yes, Amaya M recommends this product! This is high quality and it's easy to put on. It looks great on my dog and it keeps him warm. Fur can get caught in the Velcro so be aware of that and this isn't for destructive dogs. I love BaxterBoo.com they have a large selection of items to choose from. I have chihuahuas and a small pomeranian that I purchase items for. Thank you Baxter Boo!